Plastic comb binding hold the covers and pages of a document firmly in place by a plastic comb inserted through punched holes. The document will lay almost flat when opened. Additional pages can be easily inserted by opening the comb. Plastic combs come in four standard colors and sizes range from 6mm to 51mm. They can handle documents from 3mm to 45mm thick. Often, they are used to bind proposals, brochures and reports. Plastic comb binding is a common form used in many organisations throughout Australia. 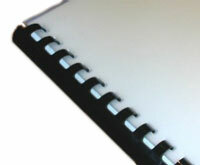 Please Contact Us to arrange your plastic comb binding quote.